Cliff Avril underwent disc surgery this week, and Pete Carroll confirmed (via Stefanie Loh of the Seattle Times) the procedure went well. Avril will be out for the season, and previous reports indicated the longtime Seahawks defensive end’s career is in jeopardy. Avril, who said in October he wasn’t thinking retirement, sent out a tweet about his upcoming recovery process. Next season will be Avril’s age-32 slate. Michael Bennett said, via Loh, he talks to Avril daily and called his friend’s future “uncertain” as he prepares for a long recovery. Here’s the latest from the NFC West. Chip Kelly agreeing to become UCLA’s head coach helped save the 49ers money. The five-year, $23.3MM contract Kelly signed with UCLA will help offset what the 49ers owe him, Matt Maiocco of CSNBayArea.com reports. The 49ers will save $7.5MM because of Kelly’s Bruins agreement, per Maiocco, adding the team would have owed its one-season coach approximately $14MM between 2018 and ’19. Now, UCLA will pay $7.5MM of that amount. “Chip did us a solid,” a 49ers source said, via Maiocco. Kelly signed a four-year, $24MM contract to become San Francisco’s head coach last year but was fired after a 2-14 campaign. The Seahawks have yet to place Kam Chancellor on IR alongside Avril, and Brady Henderson of ESPN.com notes this might be because of the franchise’s cap situation. Seattle’s up against the salary ceiling presently at $84K, per OverTheCap, and by placing Chancellor on IR and replacing him with another player could create a tricky situation. Chancellor’s salary is guaranteed whether he’s on IR or the active roster. Henderson writes the Seahawks might not make this move until they need a roster spot. Given that five games remain in the regular season, that date appears likely to arrive soon. Bruce Arians said earlier this week he could envision Blaine Gabbert being the Cardinals‘ 2018 starting quarterback if he keeps playing the way he’s fared since taking over. Arians doubled down on that claim later this week by saying (via Sirius XM radio, on Twitter) Gabbert is not a game manager and fits the Cardinals’ system “really well.” Arians added the veteran passer can “spin it” as well as anyone he’s coached. For reference, Arians has coached Peyton Manning, Ben Roethlisberger and Carson Palmer. However, the straight-shooting coach is not known for doling out unwarranted praise. Palmer is under contract through 2018 but hasn’t made a decision about a return. Gabbert is a 2018 UFA. Chandler Jones is having an All-Pro-caliber season, and the recently extended outside linebacker credits some of his improved production to being around 15 pounds lighter than last season, Darren Urban of AZCardinals.com notes. Urban notes Jones reported to Cardinals camp overweight last year and played between 270 and 275 pounds. He’s just under 260 now. The recently extended pass rusher has 12 sacks — one more than he recorded all of last season. That’s tied with 2016 teammate Calais Campbell for best in the league and 4.5 sacks off Simeon Rice‘s 18-year-old team record. 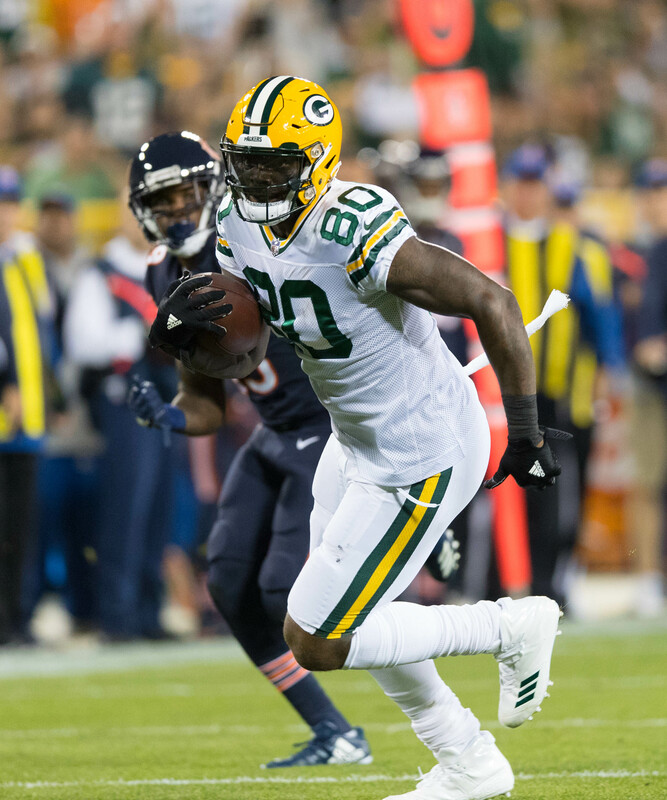 Less than a month after cutting Martellus Bennett, the Packers are attempting to recover some of the signing bonus they paid the then-coveted tight end in free agency. The Packers filed paperwork to reclaim $4.2MM of Bennett’s $6.3MM signing bonus on Thursday, Rob Demovsky of ESPN.com reports. They waived Bennett with a “Failure to Disclose a Physical Condition” designation, leading to this decision — one that was in the works. Bennett’s bonus was to be spread over the life of his three-year, $21MM deal, creating the $4.2MM figure now in dispute. Bennett alleged the Packers were well aware of his shoulder problem, reportedly a torn rotator cuff, dating back to when he signed. He said it worsened while in Green Bay and criticized a team doctor for convincing him to put off a surgery he reportedly was told by independent physicians he needed. Other Packers, present and past, came to Dr. Pat McKenzie’s defense, and Clay Matthews — per Demovsky — said he and his teammates “got a good laugh” when Bennett suited up for the Patriots during his first game back with them after sitting out that previous Monday with the Packers because of the shoulder malady. The 30-year-old tight end is now on IR after suffering a hamstring injury, and he will undergo shoulder surgery. Bennett passed a Patriots physical, and the league office didn’t have any issues with how the pass-catcher’s team change went down. The NFLPA is aware of this situation, Demovsky reports, adding an arbitrator is expected to review this matter before next season because of salary cap purposes. The Packers could have gone after Bennett’s entire bonus, but Demovsky notes him playing in seven games with Green Bay makes only seeking the remaining $4.2MM a stronger case. With Bennett’s bonus on their books, the Packers are projected to have more than $43MM in cap space in 2018. Bennett said earlier this season he was considering retirement at its conclusion. 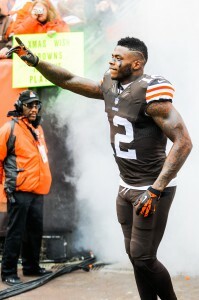 The Browns have officially moved Josh Gordon from the commissioner’s exempt list to their 53-man roster, putting him in position to play in a regular-season game for the first time since December 2014. Gordon will also be a starter against the Chargers on Sunday despite the three-year absence, with Hue Jackson emphatically confirming as such on Thursday. Cleveland cut safety Justin Currie to make room for Gordon on the roster, Nate Ulrich of the Akron Beacon Journal reports (on Twitter). There haven’t been any setbacks in Gordon’s return this time, and the 26-year-old former All-Pro will join Corey Coleman in the Browns’ lineup in Los Angeles. Gordon did not look like his dominant 2013 version upon returning from a suspension in November 2014, but he shined during the 2016 preseason before another substance-abuse ban put his NFL career on the ropes. Jackson, who was ready to move on from Gordon last season, has raved about the talented pass-catcher throughout his time practicing with the team this month. The Browns have struggled throughout the season in assembling a wide receiver crew. This marks the most depth they’ve had at that spot in a long time. Gordon returning for just five games in 2017 will keep him under contract for two more seasons in Cleveland. The Falcons could be without Desmond Trufant this week as he navigates concussion protocol, and the defending NFC champions brought in Leodis McKelvin for possible insurance. McKelvin worked out for the Falcons on Thursday, Field Yates of ESPN.com reports (on Twitter). McKelvin has yet to play this season but has participated in multiple auditions for NFC teams. Both the Rams and Saints brought McKelvin in for visits back in August, but each team moved on from the 32-year-old defender without an agreement. The Falcons, though, could be down their No. 1 corner. And key contributor Brian Poole is also dealing with a back injury. The Falcons, though, have six cornerbacks on their 53-man roster. 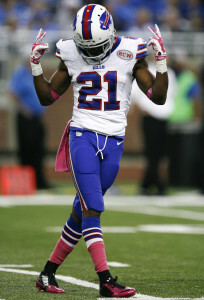 The Eagles released McKelvin in February after one season. The former first-round pick played eight seasons in Buffalo before moving to Philadelphia. Known additionally for his return skills, McKelvin started 12 games for the Eagles last season and has 72 career starts on his stat page. The Jets have slunk to 4-7 after a promising start, but Todd Bowles‘ job appears to be safe going into Gang Green’s December slate. Sources throughout the organization are “raving” about the third-year coach’s ability to coax what he has from this young team, Ralph Vacchiano of SNY.tv reports. Bowles’ Jets are one win away from last season’s total, and five of New York’s seven defeats have come by one score. Vacchiano notes a short-term offseason extension is possible, and while he expects Bowles to receive a fourth season with the Jets, that won’t be decided until the offseason. Here’s the latest from the Eastern divisions in advance of Thursday night’s NFC East clash. Despite the Giants‘ panned decision to bench Eli Manning, the franchise quarterback places a value on playing an entire career for one team, Albert Breer of SI.com notes. So, a Tony Romo-esque exit shouldn’t be ruled out. However, Manning reportedly wants to continue playing and sees “several” destinations that would suit him. Breer adds Manning won’t simply go to a quarterback-needy team just for the sake of continuing his career, though. Despite Manning having a sub-par age-36 season as the Giants slog through an injury-riddled campaign, multiple defensive coaches told Breer the 14th-year passer still has quality football left. “I think he has a lot left,” one of the coaches told Breer. “No offensive line, zero run game and he lost his four top receivers in the same game. So it’s hard to truly assess him.” Although it’s early to make these proclamations, Breer sets the Tom Coughlin-led Jaguars as the frontrunner to land Manning. On the topic of Big Apple quarterbacks, the Jets could well look to bring back Josh McCown for more stopgap work, Vacchiano notes. The team is obviously going to be ready to enter the quarterback market, but McCown staying on as a backup may be a workable scenario for Gang Green. This would push Christian Hackenberg further toward the back burner. Bowles already announced McCown would remain the starter, barring injury. One of the most notable long-running dramas in the league’s near-25-year history of free agency looks be set for a third go-round, with Kirk Cousins still not attached to a long-term deal. The Redskins will not be using the transition tag on their quarterback, but JP Finlay of CSNMidAtlantic.com writes the team should still use the non-exclusive franchise tag. This would cost Washington a staggering $34MM, but unlike the transition tag, it would force other teams to fork over two first-round picks for the right to sign Cousins, who will enter his age-30 season in 2018. Trent Williams will be protecting Cousins against the Cowboys tonight, Ian Rapoport of NFL.com tweets. Jay Gruden told NFL.com’s Jane Slater this is a pain-tolerance issue regarding Williams’ knee, one he’s admitted he will need surgery on. With the Redskins on the outer fringe of the NFC wild-card race, an in-season Williams surgery would make sense rather than extend the rehab time — one that could be around six months, per the eighth-year tackle — farther into 2018. Jameis Winston is on track to return for the Buccaneers this weekend after missing time with a shoulder injury. But the third-year quarterback potentially has another battle to fight off the field. An Uber driver accused Winston of sexual assault, and although he’s denied the allegation, the NFL’s launched an investigation that is expected to carry over into the offseason. Thursday, Winston was asked if he’s worried a suspension would come his way. The Bucs quarterback (via the Tampa Bay Times’ Greg Auman, on Twitter) said he has “no fear at all.” ESPN.com’s Adam Schefter reported earlier this month many around the league expect the Winston proceedings to become a contentious process. Here’s the latest from the NFC South. Ron Rivera is comfortable playing Greg Olsen on Sunday even if he doesn’t practice this week, Joe Person of the Charlotte Observer tweets, adding the Panthers‘ Pro Bowl tight end’s rest thus far during the practice week is “precautionary.” Olsen aggravated the foot injury that sidelined him for most of this season on Sunday and returned this to see the Charlotte-stationed foot specialist who performed his surgery, Person reports (on Twitter). Olsen did not re-fracture his foot, per Person, but has a pain-tolerance decision to make before playing. He’s uncertain to face the Saints, who have their own issues at tight end. Coby Fleener will not play in Sunday’s pivotal matchup with the Panthers. The Saints tight end is in concussion protocol and is week-to-week, but he’s not going to be ready for Week 13, Ian Rapoport of NFL.com tweets. The NFL insider notes this unfortunate setback could linger for Fleener. While not a high-end threat in the Saints’ passing game, Fleener has suited up in all 11 Saints contests this season. Backup Josh Hill has just nine receptions this year. Willie Snead has joined Fleener as a bit player in New Orleans’ passing game, being well off his paces set the past two seasons. The third-year wideout admitted he is frustrated about his current role, one that has him at just three receptions for 32 yards, Amos Morale III of NOLA.com notes. Snead served a three-game suspension and missed multiple games due to injury, but for an exclusive-rights free agent that came into training camp wanting an amended contract, Snead is having a disastrous season for that prospect. He caught 69 and 72 passes the past two years, respectively, and approached 1,000 yards in each. Snead will be a restricted free agent in 2018. It will take a contract similar to the one the Panthers authorized for Trai Turner to keep the Turner-Andrew Norwell guard tandem intact long-term, Joel Corry of CBS Sports writes. The recent rise in guard money figures to benefit Norwell, a UFA-to-be and possibly set to be the top guard available on next year’s market. The franchise tag won’t be an option for Carolina, considering the system groups all offensive linemen together, and Corry writes Norwell could exceed Kevin Zeitler‘s guard-record five-year, $60MM pact. A trouble spot at the beginning of the season, the Saints’ tackle situation has stabilized as they made their way into the NFC playoff race. But they won’t have an insurance policy that was once possible. Zach Strief will not come off IR this season, Mike Triplett of ESPN.com reports. The veteran right tackle has been out since early October due to ACL and MCL injuries, and Triplett reports those maladies required surgery earlier this month. Upon placing Strief on IR with what was then called an MCL sprain, the Saints hoped he would be able to return this season. But the 34-year-old blocker now has an uncertain future after a 12-year run in New Orleans. While Strief and Drew Brees are the longest-tenured players on the roster, Strief has another year on his contract — unlike Brees. But the veteran tackle has taken a year-to-year approach with his career. Coming off a serious injury and having seen first-rounder Ryan Ramczyk commandeer his position, Strief could see his tenure with the team conclude. However, the former seventh-round pick does have a team-friendly deal ($1.1MM base, $5.1MM cap figure). Ramczyk and Terron Armstead are now entrenched as New Orleans’ tackles, although Armstead — who missed time with a labrum injury this season — is now dealing with thigh and shoulder ailments. 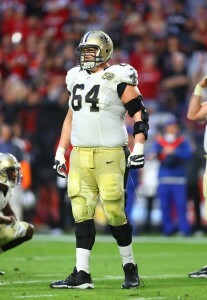 Strief took over the Saints’ right tackle job in 2011 and has 98 career starts, including playoffs, during his 12-year run.